The comparison of the two heavyweight scopes, the ACOG scope vs EOTech to determine which is better in terms of budget and performance. Both scopes share some similarities in common and have been used by the United States military in various military operations. Knowing the features of both scopes will make it easier to make a decision on which is more suitable to buy. Let’s look at the features briefly. The scope market is quite large, as you will find different brands in the market with different quality. There is no luck in choosing a good quality scope. What you need is the right information to help you make the right decision on which scope is more suitable. Before comparing the ACOG vs EOTech, let us look at factors to consider if you were to buy a different brand of scope other than these. The cost of the scope is one of the factors to consider before making decisions. Scopes come in different prices and quality, so compare the quality and cost to know the value. Decide on your budget after evaluating the different scopes to find which is most suitable. Also, remember you don’t need to break the bank to find a good quality scope. Decide how much you are willing to spend on your first scope or a brand new scope and if it suits your budget-size. A lightweight scope is always a great choice of scope. Whether you are buying for the first time or going for a replacement, be sure that the scope you are buying is not too bulky. In fact, the scope shouldn’t add too much weight to your weapon. Durability can be determined by considering the material used in making the scope. Is not a good quality material you can count on? Is the scope well sealed to prevent moisture and dust from gaining access to it? Find out if the scope is water resistant in case you find yourself in a wet environment or condition. You might be hunting or practicing in a faraway place without shade and the rain could start falling out of the blue. Accuracy is one of the reasons for buying a scope. There are good quality scopes out there, so ensure you get what you think is best in terms of performance. Besides accuracy, consider the ease of use. Is the scope easy to adjust? You might be on the field and might have a greater need to adjust the scope as far as possible. Most scopes are very comfortable and easy to adjust. You don’t even need tools to adjust them even. They have external adjusters which you can use to adjust the elevations and windage conveniently. The first thing to know is that both companies have been in existence for decades. They have championed the scope business for decades and have loads of experience in scope making behind them. Let’s look at both brands before drawing our conclusion. Trijicon has been in the scope making business for quite some time. The company produces great quality scopes that perform excellently well. Ability to hold zero make the Trijicon ACOG a reliable scope for the money. It is well built and made of aircraft grade aluminum alloy. In fact, the quality of the housing system makes this scope almost indestructible and reliable. It is suitable for even the most demanding of hunting conditions and environment. Besides having a rugged design, it has an illuminated reticle and brightness adjusts automatically according to the light available. You can use it as a CQB sight when shooting with your two eyes wide open. In fact, there is no other optic prepared for combat as the ACOG. The ease of setting up the ACOG makes it a great scope. If money isn’t the issue, then this is one of those scopes to invest on. 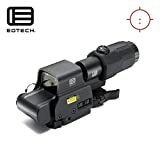 The EOTech was made in the United States of America. It features a 65MOA circle and two 1MOA dots for aiming. The EOTech also has a 3x magnifier a feature which the ACOG does not have. The battery latch and cap of the EOTech are replaced with an O-ring and tethered cap for proper sealing. The device has been tested multiple times and confirmed by the United States Special Operation Command to be combat ready. The EOTech also offers two eyes open shooting, which is also obtainable with the ACOG. In addition, the device has side buttons that are very easy to operate. The buttons are very easy to adjust and it features a quick locking detachable lever that can be attached or removed easily. The device uses a good quality battery that can last for at least 600 hours when used continuously at the normal settings. ACOG vs EOTech magnifier – Who is the Winner? Both products are great to invest in, but I would go for the magnified EOTech if offered both. The EOTech is less expensive than the ACOG. And both can handle being used in more intense hunting or combat situations. Besides the EOTech is less expensive than the ACOG, ACOG, on the other hand, uses tritium which is safer to handle. The tritium also has a lifespan of 15 years before replacement is needed. The EOTech only requires batteries. The single battery can last for 600 hours in normal settings. In fact, both have cons too, but the 15 years lifespan before the tritium is replaced isn’t a viable option for me. Replacing the battery would be less expensive than the tritium. The two scopes are amazing. In fact, hunters and other persons who have a need for scopes are very fortunate to have to choose between both. They both perform well on the field. However, this review will help you make your choice.